There is a similarity between the Hebrew Alphabet and the Sator-Rotas. A few minutes of time spent looking at the alphabet may help us with the long worn out mystery of the Sator-Rotas. 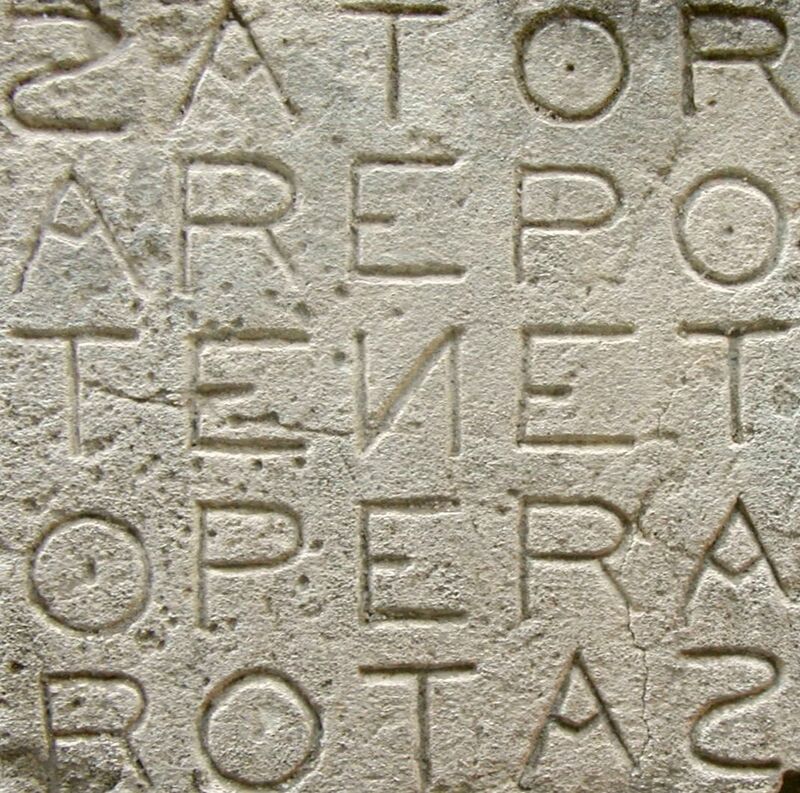 In 1933, J.P. Frey suggested that Latin speaking Jews were the likely source of the Sator-Rotas Square because of their love of puzzles and because there were Jewish settlements in the area of Pompeii, the location of the oldest known encryption. Duncan Fishwick, MA, University of St. Michael, Toronto discussed this and other ideas in his 1959 article about the Square. The Sator Rotas has perplexed many noble minds. The more time that passes the more answers are proposed. I am not proposing an answer just yet. That can wait a few more posts. I am only building on Frey’s observation noted above. Duncan’s complete article is available here. Sator-Rotas from Oppede, Luberon, France. Photo by M. Disdero, Wikipedia. The Sator-Rotas dates back to 79 AD Pompeii. We look at the Square and note that around a central N is two circles of letters in a square fashion. The inner ring of letters is EPEREPER. The exterior circle creates the name of the puzzle: Sator-Rotas or Rotas-Sator. Now observe the similarity of this puzzle to the Hebrew Alphabet. Recall that the Latin Alphabet is composed of 52 symbols for 26 sounds. There are two symbols for each sound which are a capital letter and a small letter. Similarly, the Hebrew Alphabet is composed of 27 symbols for 22 sounds. Only five sounds have two symbols but they are not “capitals.” They are used when the sound falls at the end of a word. So we might group this alphabet into two parts. The first seventeen letters do not have ‘caps.’ The last ten letters are the pairs for the sounds which equate to k, m, n, p and ts in English. The first letter that looks like an ‘N’ is the letter ‘Alef’. Because of its similarity to ‘N’ and its central place in the Sator puzzle we will pull it out and make it the center once again. 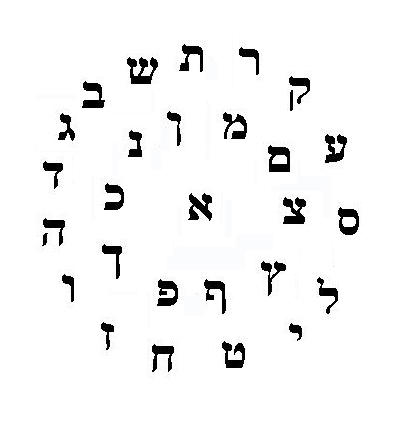 Now we have our central letter “N” or Alef, the inner circle composed of the ten letters that have endcaps and the outer ring composed of the 16 other letters. The total sum of the alphabet is 1775 and 1775 = pi x 565. Interestingly 1/1775 = .000563. The central number of the alphabet is 1 and sums to 1. The outside sixteen letter group of the alphabet sums to 1214. This is interesting but not significant here. However, it is important that the exterior ring on the Sator Square is also made of 16 letters. It is of ultimate importance that the ten letters with endcaps sum to 560. This is nearly the same as 565 seen above. So, we have an image created by 1 in the center, then 560 and then 1214.
and plus the central ‘Alef’ or 1 equals 565. The 560 and 565 of the alphabet reappears in this puzzle as the 564 or 565 of the center of the puzzle. All those familiar with Hebrew will recognize this pattern, 565, from the letters which spell Yahweh or 5,6,5,10. Interest piqued? Note this other little mathematical fact about the alphabet. That 1 and 560 appears in other places. Two instances are 10560 and 1056. And 10560 is 2 x 5280. Which is easily recognized! No? How many feet are in a mile? We are led on a further quest…..Who designated the feet in a mile? Who designed the alphabet? What is the meaning of 56? I let this whole matter rest for consideration before the Sator Rotas is examined further. Thanks for reading. Feel free to leave a question or a comment. This entry was posted in Ancient History, Mysteries, Religion, Science and tagged Biblical riddle, gematria, Hebrew Alphabet, Noah's age, Out of place artifact, Sator Rotas, torah. Thanks for the comment. I cannot say that I have come across any other blog/forum with the same topic. However, the older books predating the modern alien hysteria are a good source. I suggest John Michell’s “The Dimensions of Paradise.” It demonstrates how these numbers are embedded in the ancient texts. This is really great,thank you for sharing this info!